- Alaska Polar bear stock photos, Ursus maritimus photos. Polar bears are marine mammals of the arctic, and inhabit the circumpolar regions of the northern hemisphere. Listed as threatened species in the US by the Fish and Wildlife Service, polar bears face the threat of habitat loss from global climate change. Polar bear photos on this page include adult polar bears, male and female polar bears and polar bear cub photos. Mostly taken in Arctic Alaska, in the Beaufort Sea and edges of the Arctic National Wildlife Refuge. Stock photos of polar bears. More polar bear photos here here. Polar bear rolling in snow, Alaska. Polar Bear mother nursing cub, Alaska. Polar bear cub and mother, Alaska. Photo of a backlit polar bear, Alaska. Polar Bear (Ursus maritimus) Arctic National Wildlife Refuge, Alaska. 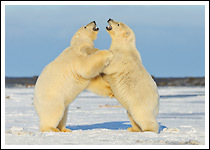 Polar Bears fighting, Arctic National Wildlife Refuge, Alaska. Two polar bears fighting on snow. Polar Bear (Ursus maritimus) Arctic National Wildlife Refuge, Alaska. Polar Bear and moon rising, Alaska. Polar Bear sitting beneath rising moon. Polar Bears walking under the moon. Two Polar Bears under the moon. A Polar Bear walks under the moon. Photo of Polar bear and Brooks Mountains Range, ANWR, Alaska. Polar bear shaking water and snow, Alaska. Polar bear walking, arctic Alaska. Polar bear with paw raised, ANWR, Alaska. Three young polar bears cubs at play, arctic Alaska. Male polar bear, Ursus maritimus photo, Alaska. Polar bear on the Beaufort Sea, Alaska. Polar bear standing on snow, arctic Alaska. Polar bear cub photo, Alaska. Subadult Polar bear (Ursus maritimus), Alaska. 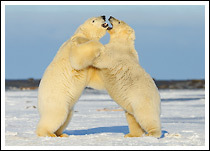 Polar bears wrestling photo, Alaska. Polar bear (Ursus maritimus), Alaska. Polar bears at play, Alaska. Adult male polar bear in Alaska. Polar bear female and cubs sleeping. A backlit polar bear photo, Alaska. Backlit polar bear resting, Alaska. Polar bear at sunrise, Alaska. Polar Bear on ice photo, Alaska. Polar Bear playing with a stick, Alaska. Polar Bear young playing, ANWR, Alaska. Polar Bear cubs playing, ANWR, Alaska. Polar Bear in evening light. A young polar Bear on Beaufort Sea Ice. Polar Bears on Beaufort Sea Ice. Polar Bear walking on a ridge in Alaska. Polar Bear by the Beaufort Sea, Alaska. Male polar bear and the Beaufort Sea. Male polar bear enters the Beaufort Sea. Polar Bear at Barter Island, Alaska. Polar Bear portrait or headshot, Alaska. Polar Bear and the moon rise, Alaska. Three Polar Bears (Ursus maritimus) Arctic National Wildlife Refuge, Alaska. Polar Bear feeding on whale bones, Alaska. Picture - Polar Bear approaching intently, Alaska. Polar Bear picture, approaching intently, Alaska. Polar bear walking along the beach, Alaska. Polar bear cub on snow, Alaska. Polar bear at Beaufort Sea, Alaska. Large male polar bear (Ursus maritimus), Alaska. Polar bear cub (Ursus maritimus), Alaska. Polar bear cub calling, Alaska. Polar bear mother and cubs, Alaska. Polar bear walking on ice, Alaska. Polar bear standing on ice, Alaska. 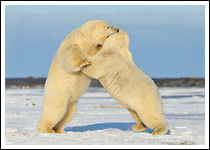 Polar bears fighting, Arctic Alaska. Two polar bears play, arctic Alaska. Adult polar bear male, Beaufort Sea, Alaska.